Can I Get Social Security Disability For Degenerative Disc Disease? Question: Can I get Social Security disability for degenerative disc disease? Answer: Possibly, depending upon how bad it is. Your spine has quite a few parts. The most important is the spinal cord, the bundle of nerves running from the brain to the body. Individual nerves branch out from the spinal cord to various parts of the body. Supporting the body and protecting the spinal cord are the vertebrae, the bones in our spine. These bones are sort of stacked on top of each other. You can’t have these vertebrae rubbing against each other. They would grind themselves down in no time. Separating the vertebrae are discs (or disks, if you prefer). These are leathery bags with some jellylike material inside them. Think of them as cushion between the vertebrae. With age, these discs degenerate, that is start to break down. The jellylike material inside the discs can get a bit dried out. The leather of the bag starts to break down. 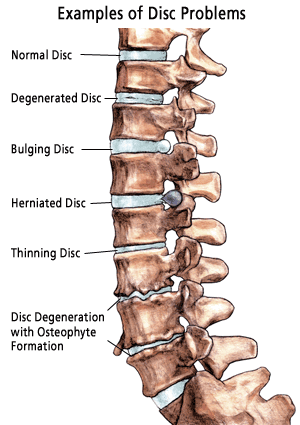 The disc does a less satisfactory job of separating and cushioning the vertebrae. This can cause pain, both in the back itself and in the areas of the body served by the nerves affected since they may get pinched by the degeneration of the disc. The side wall of the disc can develop a weakness and a bulge can develop. A really big bulge is a herniated disc which can really pinch a nerve. People usually don’t get degenerative disc disease at a young age. Age makes a big difference with Social Security disability claims so often people who cannot work due to degenerative disc disease have good Social Security disability claims. We would be happy to talk with you about your Social Security disability claim. We represent disability claimants from Advance to Aulander, from Buies Creek to Bailey.